Dr. Siri Paiboun, the ex-national coroner of 1980s Laos, risks life and limb with his best friend, Comrade Civilai, to smuggle into the country a Panavision Panaflex Gold movie camera and 20 reels of film that literally fell off the back of a truck in Thailand in 1977 during the filming of The Deer Hunter. The two friends have big plans to shoot a blockbuster Lao version of War and Peace. As seen from their own personal experiences, of course. Dr. Siri writes an ambitious screenplay, and they set off on a quixotic mission into Lao bureaucracy to obtain approval (and perhaps even funding) for their project. Now if only they could figure out how to operate the camera. Meanwhile, their friend Phosy Vongvichai has been promoted to chief inspector of police in Vientiane with a mandate to clean up the rampant corruption infecting Lao law enforcement. His time becomes monopolized, however, by the discovery of a young woman’s bones at the base of the Anusawari Victory Arch at four o’clock in the morning. When his wife, Nurse Dtui, observes that the bones were gnawed by small animals, and the trail leads to a shipping crate at the airport that had been used to transport civets, the investigation draws Chief Inspector Phosy and the rest of the “noodle shop justice league” into the cruel, horrifying world of illegal animal trafficking. 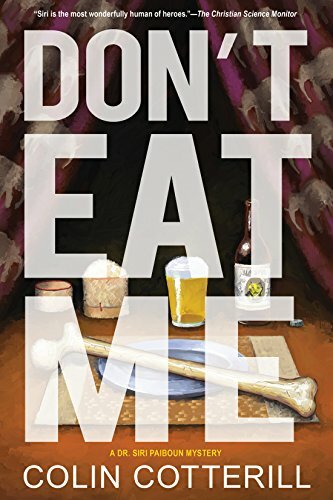 Don’t Eat Me is Colin Cotterill’s 13th installment in the Dr. Siri Paiboun series of Lao crime novels. We’re warned up front that Dr. Siri attracts trouble “like ants to a greasy pork sausage,” and this adventure is no exception. However, it’s actually Phosy who occupies center stage in this particular drama, as he and his cohorts investigate the notorious and distasteful Judge Haeng, Monsieur Yves, who used to control animal smuggling in the country, and Comrade Vilai Savangkeo, the current trafficking kingpin. Cotterill writes effortlessly, with an excellent sense of timing and a constant undercurrent of humor. Dr. Siri, his wife Madame Daeng, and the rest of the gang are a delight, as always. It’s a good job they are, because the central theme of the novel, the cruel and inhumane trafficking of animals, is sobering and upsetting. As the author points out in a brief Afterword, the circumstances of the illegal animal trade described in the book are true, vastly understated, and more widespread today than they were 40 years ago when the novel is set. Nonetheless, the author follows Madame Daeng’s sage advice not to “put all our fish balls in one strainer,” deftly shifting our attention from Phosy’s investigation to Dr. Siri’s filmmaking high jinks, then on to the rooting out of police corruption, then back to the animals again in a difficult juggling act brought off with admirable success. Don’t Eat Me is a story that will engage you with its delightful characters and humor and compel you to think seriously about the major problem of illegal animal trafficking that doesn’t get the attention it deserves. Colin Cotterill has written this one from the heart. Given his personal involvement in helping temple and street dogs in Chumphon, Thailand, where he lives, it’s not a surprise. Would that all of us could use our talents not only to entertain but also inform and illuminate so effectively.